Re: THANK YOU, LEIGH WEBB AND THE MASS BAY RRE! That's great news! How many grants has the museum received from Mass Bay RRE? Other grants we have received over the last 10 years include those from the Emery Rail Heritage Trust, the Amherst Railway Society, the Narrow Gauge Preservation Foundation, the Tom E Dailey Foundation, the National Railway Historical Society, and the Mystic Valley Railway Society. And of course, the National Society for the Preservation of Covered Bridges. I may be forgetting a few others. Thanks to Mass Bay and to all WWF'ers who fornished information to them. Also Ed, thanks for the listing of award sources over the years. It really demonstrates the widespread support for WWF efforts! Once again, we have been honored. This is the result of many actions by many folks. At the core is the grant team and the publicity team who get the word out to the public at large. More importantly, what I hear most often, even as far away as here in Virginia is that the WW&F consistently does what they say they are going to do. Our reputation of, without fail, accomplishing our published goals is well known in the preservation and the railroad community. I met someone just last weekend who, when he found out that I volunteered at the WW&F, knew of our museum, knew what projects we were working on, and wanted to know more. This reaction happens more than one would think. A big Well Done! to all involved. Nice response to the various questions prompted by the announcement in Trains. Wonder why someone would be so vulgar in wanting figures for the extension. If someone such as Anna wants to know, would it be wrong to simply state how much money has gone or will go into the project for just the mountain work alone? Thats good at least. I was kind of confused by the comment, then her "signature" at the end made the comment seem vulgar. As for work, whats that? Lol. Nice article, Wayne -- thanks! 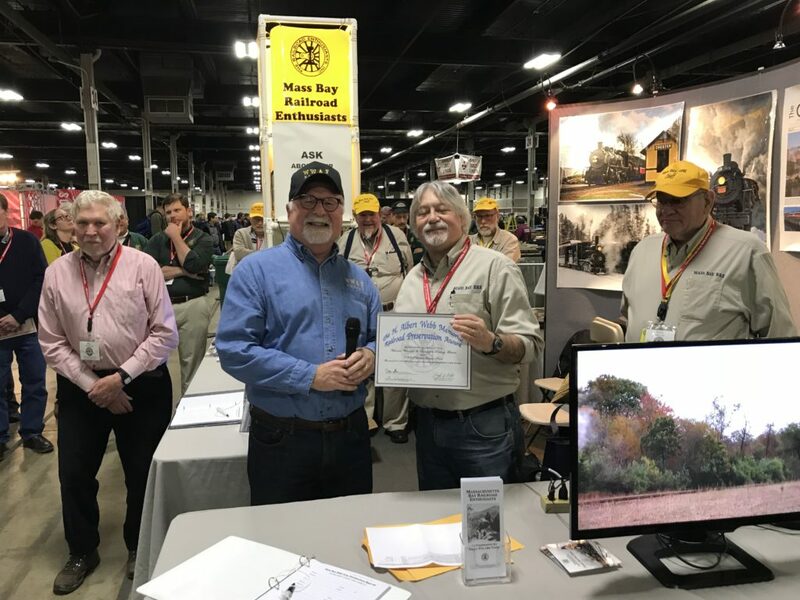 An official presentation by the Mass Bay Railroad Enthusiasts of the 2019 H. Albert Webb Memorial Railroad Preservation Award will take place this Saturday, 4/27 at approximately 6pm on the station platform at Sheepscot. Representatives of the Mass Bay RRE, including the donor, Leigh Webb, will be joining us for dinner preceding the award. Following the presentation, an inspection of the line is planned. All are welcome to attend. Please be sure to thank Mass Bay RRE, and Mr. Webb for their generous support, not only for this award, but for years past - including the 2010 H. Albert Webb Memorial Railroad Preservation Award which funded the southward extension of the then Car Barn, now converted to a machine shop. The WW&F is only the second organization to have received two H. Albert Webb Memorial Railroad Preservation Awards.